Who knew stingrays could be so much fun! This brand new excursion in Playa del Carmen will take you over to Cozumel Island, where you will visit the one and only Stingray Beach. 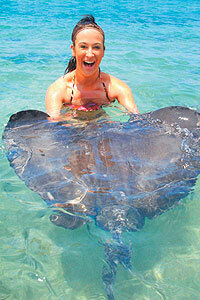 Here, in the clear blue waters of Cozumel, you will get to hold, touch and even feed real live stingrays! Breathe easy, their barbs have been removed so it's totally safe, and oh so fun! Feel their "Hoover-like" mouths on your hands, it's really exciting! After your stingray encounter, you can go snorkeling with the stingrays and of course lots of beautiful tropical fish too! Watch the resident critters provide additional entertainment while relaxing at the beach club for the rest of the day. The beach club features a water trampoline for the kids, and tables, umbrellas, chairs, shops, and restrooms. End your day by exploring downtown Cozumel with or without your guide. Where else can you do this? Hold, Touch, Pet, and even Feed Live Stingrays! Experience Snorkeling with Stingrays and Fish! Watch Hermit Crab Races and Pose with Iguanas! Pose for Photos with Stingrays and Iguanas! Enjoy All-Day Use of Beach Club Facilities! Visit Cozumel Island and Explore Downtown! When: Wednesdays and Sundays at 9:30 AM. Where: Meet at Senor Frog's in Playa del Carmen. Exact directions will accompany your confirmation. How Long: 6 Hours Approximately. Stingray Encounter lasts 1 hour. Prices are in USD and Include All Taxes. Kids: Ages 4 and up. Kids prices apply to ages 4-11 years. Restrictions: Pregnant women and guests with back/neck injuries or respiratory conditions are not permitted. Cameras are only allowed during snorkeling portion of the water activity. Only Biodegradable Sunscreen may be used.